The Standard Chartered Hong Kong Marathon is a popular running event, founded in 1997, to be held in January. In addition to the full marathon, a 10km run and a half marathon are also held. Around 70,000 runners take part each year across all events. current men’s record is 2:11.27 held by Dejere Abera; the women’s record is 2:30.12 held by Misiker Demissie.High levels of humidity and a difficult course make finishing times for the Hong Kong Marathon comparatively slower than other large marathons. Hong Kong Marathon was first granted as IAAF Bronze Label Road Races by International Association of Athletics Federations (IAAF) in Year 2012 race, and it was upgraded as IAAF Silver Label Road Races in Year 2013 race.We cordially invite all of you to compete in our - Most Supportive Group Award, which has established since 2006 and is specifically designed to award team entries for the Marathon. This prize aims to encourage runners within companies or organizations to register as a group and to promote team spirit. Companies or Organizations are qualified to enter this competition by forming a marathon group with a minimum of 100 members. Marathon participants must be 20 years old. Half Marathon participants must be 16 years old. 3 hours for half marathon & 6 hours for full marathon. Hong Kong Marathon belongs to my personal favorites. I participated there in 2010. It started early in the morning shortly before sunrise, but already at this time we had about 25 degrees Celsius and ... Hong Kong Marathon belongs to my personal favorites. I participated there in 2010. It started early in the morning shortly before sunrise, but already at this time we had about 25 degrees Celsius and a humidity of 95%. The course is characterized by impressing bridges and tunnels you have to pass. On the last kilometers you also have nice views at the scenic skyline of Hong Kong. As the whole city spreads over mountainous terrain the run is the hilliest city marathon I ever did. Because you are running on highway roads to a great extent you cannot expect a lot of spectators. Only just before the finish line there is a very good support of cheering people. In conclusion: It is a very special marathon in a very special city. And it is a very good reason for a short escape from the European winter. 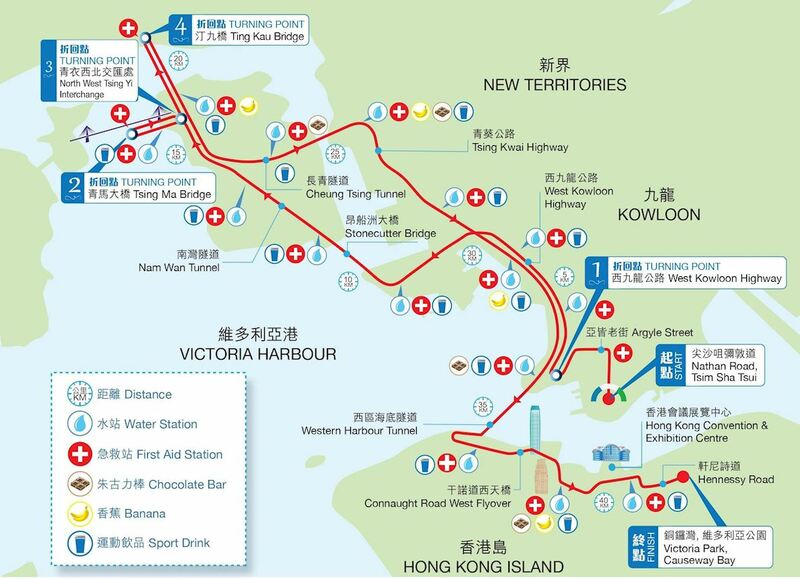 While running the Hong Kong Marathon you will pass sites such as: Ting Kau Bridge, Tsing Ma Bridge, Victoria Habour and The Hong Kong Convention & Exibit Centre. Nathan Road, Tsim Sha Tsui ( NearHotel Mira) - Nathan Road south of Kansu Street - Nathan Road(N/b) north of Kansu Street - Argyle Street - Cherry Street(W/b) - Lin Cheung Road(S/b) - West Kowloon Highway(S/b)- Ngong Shuen Chau Viaduct(Kln/b) - Stonecutters Bridge(Kln/b) - East Tsing Yi Viaduct(Kln/b) - Nam Wan Tunnel(Kln/b) - West Tsing Yi Viaduct(Kln/b) - Tsing Ma Bridge(Kln/b)- Ting Kau Bridge(S/b) - Cheung Tsing Tunnel(Kln/b) - Tsing Kwai Highway(S/b) -West Kowloon Highway(S/b) -Western Harbour Crossing(S/b) - Connaught Road West Flyover(E/b) - Man Po Street - Man Yiu Street(S/b) - Lung Wo Road (E/b) - Fenwick Pier Street(E/b) - Convention Avenue(E/b) - Hung Hing Road - Marsh Road Flyover - Lockhart Road(E/b) - Percival Street - Hennessy Road(E/b) - Yee Wo Street(E/b) - Sugar Street - Victoria Park.